The Laura Mercier Signature Colour Essentials for Face, Eyes & Lips ($80) set developed for this year's Nordstrom Anniversary sale is sold out, but I have one to give away. In this gorgeous set, Mercier brought her signature style to an exclusive color collection, with the perfect makeup essentials to create a flawless face. Featuring a new design, the three-well custom compact holds an exclusive Vintage Pink Second Skin Cheek Color to give the skin a natural rosy radiance, plus two classic Eye Color Duets in a range of soft pink neutrals to deep brown plums (Morning Dew/Primrose and Topaz Kir Royal) for endless options. Add smoky-taupe effects with Twilight Caviar Stick Eye Color and voluminous lash drama with Black Full Blown Volume Mascara. Finish the look with a hint of soft pink using the full-sized Sweetheart Lip Glacé. The collection also includes a deluxe travel-size Foundation Primer and Travel All Over Eye Colour Brush for a seamless application. You all know that Laura Mercier makes superb makeup. This set is a nice introduction to her range. I'd kill to pull out that Cheek Color. The deadline for entries will be Saturday, September 22, at midnight. The next morning, I will use a random number generator (random.org) to select the winner. I will e-mail the winner on Sunday morning. The winner will have 48 hours to reply to my message and provide a shipping address. After 48 hours, the prize will be forfeited, and another winner will be selected. Make sure to check your e-mail - and look in your spam folder - when the contest ends. Wow, that is a gorgeous palette. Love to read your posts on all things beauty! Gorgeous palette-- I love Laura Mercier! Love Laura Mercier eyeshadows and I'd love to win this palette! Oh, Laura Mercier is my gal for makeup. She probably represents more of my makeup collection than any other brand. Great products for a great giveaway. Thanks Cg! Love your blog - I found out about it from the CafeMakeup. I admired the Laura Mercier set during the anniversary sale and wished so I could have purchased it. Thank you for a chance to win! The palette looks awesome. I usually pop by here via Rogue Deluxe "updated blog links"! Lol. Now that is one beautiful palette! I looked at this but held off during Nordstrom's Anniversary Sale! LM is one my favorite brands for polished, understated elegance. I follow via email & follow you on twitter as well! This is exactly what I need to complete my "new fall look" - never tried Laura Mercier before, but always wanted to - the colors are very compatible with my complexion - so - I follow you via GFC as "The Beauty Godmother", via e-mail as xenamcr at gmail dot com, and via Twitter as @xenamcr. Maria Carmela Renna - and thanks again for yet another classy giveaway! I'd love to have a flawless face!! These colors look perfect for a fair skinned red-head like me teeheehee!! A very nice palette. Thank you! Wow, it includes a Caviar eye stick! That's a fantastic set! Following by email with same email! Gorgeous palette! melisand61 at gmail dot com. I don't know if I'm allowed to participate again after winning once, let me know if I can't! My email address is lulle[dot]beaumiroir[at]gmail[dot]com and I follow your blog through GFC! Thank you for your wonderful giveaways! i follow you via email and twitter. Yet another fab beauty prize!! I follow through GFC [Sus] and Google Reader, both. What a beautiful prize! Thanks again for the chance to win this, charlestongirl! I would love to win this contest. I have started a new job and need to look a bit more polished. This kit would help me on my way. I love your blog, by the way. Thanks for taking the time to put it together, I know it takes a lot. What a beautiful set. I just tried the mascara for the first time and was very happy with it. Faithfully read you every day! Thanks for the lovely giveaway. Great giveaway contest, really love the colors in this palette. Thanks for your generousity and a chance to win!!! I've only tried LM tinted moisturizer and lipstick, but both were lovely! Oohhhhh! So pretty ! Would love to have that! Such a beautiful palette! Thank you for wonderful giveaway! I follow you by email. Love that Laura Mercier caters to all skin colors and types. Her makeup range has a beautiful variety of subtle and classic colors. So chic! What a lovely giveaway! Thanks for the opportunity - I follow you via rmail subscription. Love Laura Mercier! Thank You! I hear so many great things about Laura Mercier's products and I am yet to try them. Such a great set to giveaway! Thank you! I am an email subscriber. This is such an amazing prize. Would love to win. Great giveaway and thank you for the chance! I love that palette! I've been a LM gal for simply ever! I follow through your RSS feed. I have a couple pieces of Laura Mercier makeup and LOVE them. These pieces look spectacular. I'm REALLY hoping they end up mine! Thanks for the chance... I follow through NetNewsWire. Love reading your blog and would be delighted to win this prize! I've use Laura Mercier tinted moisturizer and love it. This would be beautiful to use with it. I haven't her shadows or blush. it would be fun to try them. I love Laura Mercier's oil free tinted moisturizer. I've been using it for years. Thank you for the fabulous give away once again! I am such a Laura Mercier fan. I love everything in this kit! Thanks for the opportunity! Thanks for hosting giveaways so often :) Most bloggers don't. It's very generous of you to do so for your readers. Wow, would love to win this! Thanks for the giveaway! Awesome, versatile palette!! Love your blog, too!! Wonderful pallet! I would love to win! Amazing set, I adore the palette!! Fantastic colors and wonderful quality brand!! very nice, thanks - Alica - alica at cleis dot net. A very pretty palette! The colors are great! Wow, what a Nice prize! I would love to try the caviar sticks. I have been reading a lot of nice reviews about those. I follow your Twitter account and through Bloglovin. This is an amazing giveaway! I have never tried Laura Mercier, although I hear wonderful things about the brand. I love the palette! I'd like to try the mascara. Every mascara seemd to dry out within weeks. Thank you for the dontest! I am also subscribed to your emails! I love Laura Mercier products. She does color so sophisticated & lovely. This is a beautiful set!! I am an email follower & GFC. Beautiful set! I'd love to try the lip glace! Gorgeous products! I love love love that palette! I've never tried Laura Mercier but always known her product line is amazing...Thank you for the giveaway! I also subscribe thru email to your blog! what a way to start the week :) thanks again for hosting these, you are the best! It is a lovely set. Thanks for hosting these. I have been saving up to get my first LM product: Lush Nectarine Second Skin Blush, but wow -- this giveaway would let me try a good chunk of her line! Thank you for this opportunity. I've tweeted (will email you the info) and I already follow your blog via GFC (BooBooNinja). Oooooo...that would be great to win! suselew at comcast dot net. Plummy-pink deliciousness! Thanks for all the wonderful work you put into introducing products in such a verbally pleasing and visually appealing way. I can be reached at rusthawk [at] gmail [dot] com. thank you! i really don't know the laura mercier line. this would be the perfect introduction! great palette for travel. that pink blush looks like a must have item. I love it, those eye colors are calling my name! I follow you via my email. as always, such a lovely giveaway! Wow! 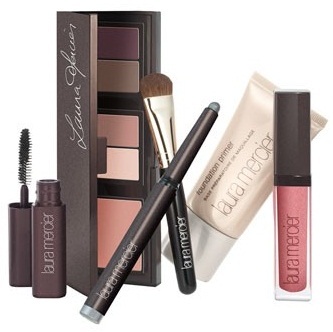 What a great combination of Laura Mercier products. Thanks! I've had one Laura Mercier product, a lip gloss, and I used up the whole tube very quickly - seriously the best stuff ever! I've always been curious about Laura Mercier and this collection looks like a good place to start! Awww A very nice palette. Thank you! enter me please! I want to win this contest! Love this set and hope to be the winner! Happy Belated birthday to you! I also have a birthday this month, 27th and am also a little older than I would like to admit but still love, love, love cosmetics! I am crazy about good skin care and putting on a "pretty face". You are such a lovely, generous lady!!! Thanks so much for this opportunity. I follow you using that address as well. Thanks! The colours are lovely--great for my fair skin. Oooh, I've been dying to try out some LM for the first time!! This set looks perfect!! Pick me, randomizer!!! Suzannem80 at hotmail dot com. I love everything LM. Happy belated birthday! I follow your lovely blog via email! yummy giveaway CG! i have never tried laura mercier makeup...but heard lot about it. subscribed to your emails. i have also retweeted your giveaway. my twitter id is pinkbelle88. I've never tried Laura Mercier (nowhere near me sells it) but these colours are just perfect for me. I LOVe Laura Mercier!! I've just tried the tinted moisturizer and it's great!!! thank you so much!! I only have a couple of items by Laura Mercier, but I really treasure them. Her products seem to be ideal for "women of a certain age", like myself. They never "shout", just enhance in the loveliest of ways. I would truly love to own these! Thank you, CG, for sharing your wonderful taste with us again. Wow! What a great prize! :-) I follow you through Google Friends as Bonnie C., and I also subscribe by email. :-) And lastly, I re-tweeted your original tweet! Thanks so much for having this giveaway, have a great night! love Laura Mercier for a simple, flawless look! This would be perfect for me. Love her products.